Ciena today unveiled Ciena 6500 T-Series, a new higher density version of our cornerstone 6500 Packet Optical Platform, providing up to a Terabit of switching capacity per slot and up to 24 Terabits in a single chassis. Ciena today unveiled Ciena 6500 T-Series, a new higher density version of our cornerstone 6500 Packet Optical Platform, providing up to a Terabit of switching capacity per slot and up to 24 Terabits in a single chassis, all while retaining the agnostic packet/OTN switching, industry leading coherent optics and intelligent software capabilities that make Ciena 6500 an industry leader. Verizon is already in the process of deploying Ciena’s 6500 T-Series as part of its next-gen metro 100G build-out across the United States. The half rack 12-slot version of the 6500 T-Series is available this month (Ciena 6500-T12 pictured above right), and will be featured on Ciena’s booth at OFC next week in Anaheim, California. A full rack 24-slot Ciena 6500-T24 shelf (pictured above left) will be available by the end of 2016. Ciena’s 6500 T-Series is purpose-built for the Terabit world, offering significantly reduced power consumption and space requirements. This combination of capacity and efficiency in size and power make the T-Series a perfect fit for metro and regional network applications where intelligent, high capacity packet-optical transport is needed. "This announcement is a big deal,” said Andrew Schmitt, Founder and Lead Analyst at Cignal AI, as part of today’s announcement. 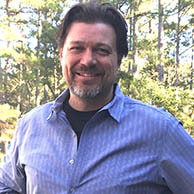 “The 6500 T-Series extends on the success of the 6500 in the marketplace and simultaneously demonstrates Ciena’s leadership in both converged packet & OTN switching and photonics." 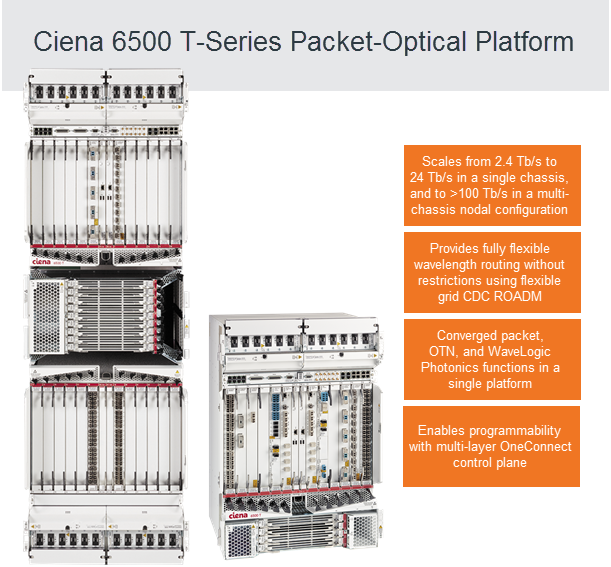 T-Series is the newest member of Ciena’s industry-leading 6500 Packet-Optical Platform family, which includes a variety of configurations and interfaces that support the full mix of Ethernet, OTN, SDH/SONET, Fibre Channel, video, and transparent DWDM services—from DS1/E1 to 100 GbE/OTU4—from metro to submarine applications. Like its siblings, the 6500 T-Series incorporates Ciena WaveLogic Photonics technology, flexible grid CDC ROADM configurations, and integrated photonic and OTN control plane intelligence. Ciena’s 6500 counts more than 500 customers across 50 countries worldwide, with more than 65,000 nodes deployed, and Ciena has consistently ranked #1 in IHS/Infonetics’ Optical Vendor Leadership survey in the “Top Packet-Optical Supplier” category.